Hotwire 0.700 (mirror) is now available. So, about 8 months ago you may remember I got really frustrated with bash for carelessly losing my history, and in my spare time, I set out to create a new developer shell. Not just a plain old Unix shell; I wanted a shell that took advantage of my computer (using a modern language runtime, and integrating with the desktop environment), rather than being limited by the “terminal emulator” concept. I’d recently tried Windows Powershell around that time as well, and thought they had some good ideas but also made some bad design decisions. I thought it was possible to do better. In short, I wanted to create a “hypershell” that was better than the Unix concept of a shell, and that was also improved on the Windows PowerShell model. Hotwire 0.700 is the first release where I think that goal is, if not achieved in many ways, much closer at hand. Previous versions were more like demo toys, but this is the first one I’d call alpha. In other words, usable in many ways, although far from complete. Many developers and power users will hopefully find it a suitable replacement for a terminal+Unix shell running as the same uid on a desktop. 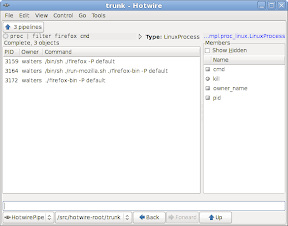 For system administrators, Hotwire doesn’t yet have a really strong story for improving the remoting experience (well, you will probably like the included ssh client), but I’m going to be taking a close look at things like func. The new webpage (mirror) has a longer explanation of things, screenshots, etc. The ChangeLog is also a useful read, especially if you’re upgrading from a previous version. And don’t forget to try the updated tutorial to get a hands-on introduction to the system.